My work with clients is based on 20 years of self-exploration following a life altering spiritual experience. This opening experience brought me great insight, but also left me painfully aware of the limitations embedded in my familiar sense of self. I have worked with teachers highly skilled in understanding the relationship between psychology and the spirit: Yayah Nadler, Radha Conrad, Rod Birney, Richard Moss, Elias Amidon, Jelaladine Loras, Lee Lozowick, and Bonnie Greenwell. Extended wilderness meditation retreats, Sufi practices which soften the heart, and being an elementary school teacher have helped me appreciate the preciousness of life as it is. I believe real healing occurs by being here for ourselves. This is an inner presence that grows with practice, and guidance, and sincerity. The core of my teaching is making space for what we experience, with self-compassion. 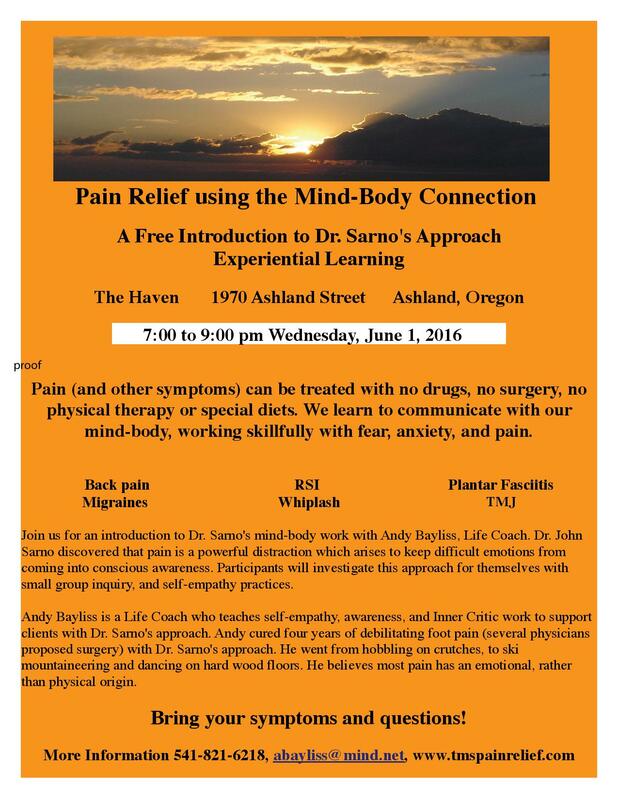 I used Dr. Sarno’s approach to cure three years of debilitating foot pain that had me scheduled for nerve surgery. Now I run, ski, dance, and have my life back, pain free. This experience leaves me with a deeper understanding of aging, anxiety, fear, and depression, and how my personality strategizes to avoid painful emotions. I love introducing Dr. Sarno’s revolutionary path to others. Originally trained in Geography and Biology, I spent many years teaching skiing, and surveying streams, and organizing wilderness expeditions in Argentina, Europe, and the Arctic. As an elementary school teacher for over a decade in Ashland, Oregon, I planted hundreds of trees with children and sat by streams writing, and sharing poetry and feelings about nature. Next to the human heart, nature is my greatest solace and teacher.